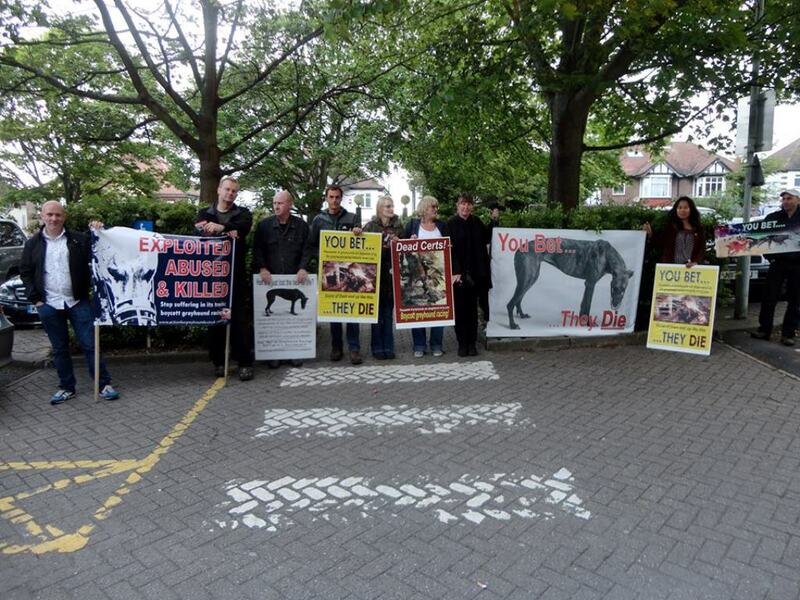 This is an archive of all the previous greyhound news articles from the UK and around the world, updates on demonstrations and requests for assistance with appeals that have featured on the Action for Greyhounds web site. For the latest information in all these areas, please visit our Facebook page and be sure to follow us to be kept right up to date! 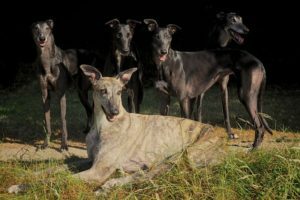 As if Australian greyhounds do not already endure horrific suffering and exploitation….they continue to be exported to Asia and Argentina. WARNING : this article contains very upsetting images. Let us hope the IGB (Irish Greyhound Board) do not get to ‘sweep this under the carpet’. 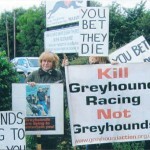 Let us hope these poor greyhounds have not suffered and died alone, in vain. The Dogs Trust Ireland are concerned that welfare and transportation regulations ‘ may have been breached’….errrm well the poor greyhounds were left two to a small cage in a transit type van on the ferry and the ferry operators were unaware the greyhounds were on the van!!!!!! let alone this, what about the fate that would have met these poor greyhounds had they have reached their destination in Spain. The long standing group are outside this track on a regular basis mostly on a Saturday evening and sometimes on a Sunday. This evening along with their awareness banners they displayed a memorial as part of Greyhound Remembrance Weekend to remember the hundreds of thousands of greyhounds who did not survive the industry. “Only 11 races this evening. Two had 5 runners, and one, only 4. But ‘Groupon’ had an ‘offer’ on, so more people went in than usual. 124 vehicles — but at least we gave out 58 leaflets, and even had time to chat to most of the newbies, who stopped for a leaflet! I’m not too bothered about the extra people. Its `holiday time,` and then, and at Christmas we’ve always had a score or so ‘extras’ -but they don’t come back ! I always have to do my little ‘pep-talk’ when we have more than 80 cars going in ! (to the team!) They get really worried, but its like I always tell them, “it only seems a lot, because we usually have such low numbers going in” (compared to other Big City tracks). 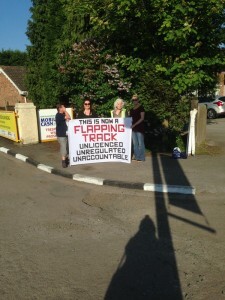 This group hold regular peaceful protests outside this track which is owned by Coral bookmakers. This evenings report was of a quiet night which didn’t seem to be very well attended. There is a great advantage for the group as the track car park is shared by the adjacent supermarket, so the group are able to distribute leaflets and chat to shoppers as well as racegoers. The group also hold other general public awareness events in and around Sussex, so if you live in or near the area, please join them if you can, they would appreciate your support greatly. 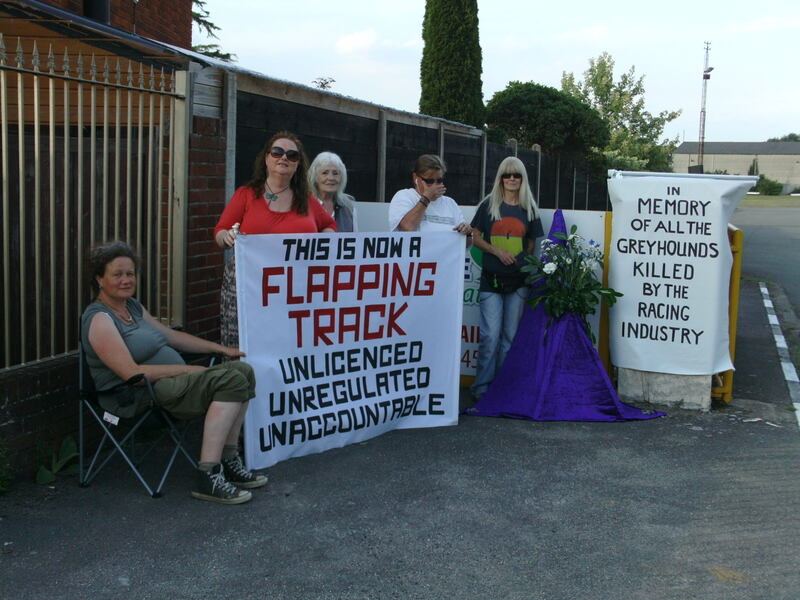 As part of Greyhound Remembrance Weekend, the group held another peaceful protest outside the William Hill (bookmakers) owned track. Although the group of mostly young ladies are relatively small at present, they are very approachable and with the great attitude they have with the public, they do manage to distribute many leaflets to racegoers as well as often being able to have sensible discussions with some too. 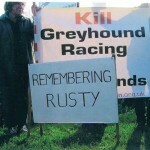 If you live in or near this track, please try to support this friendly group. We have also been asked by Tiggy’s distraught family to share the link from the facebook page they have set up, in memory of dear Tiggy in the hope this will raise vital awareness and hopefully help to avoid other hounds having such a tragic accident. The group hold regular protests outside this track and when they are not here, they join Greyhound Action in Peterbourough (GAIP ) with protests outside the Fengate track. 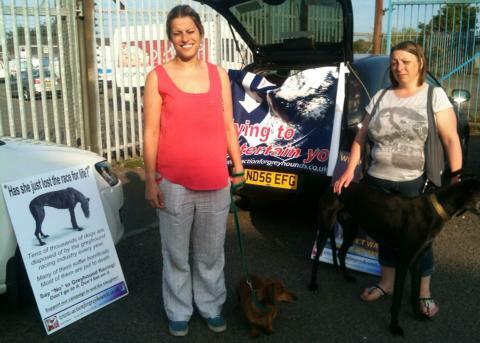 The group are gaining new supporters all the time and although sometimes small in numbers, manage to always raise vital awareness and often get good feedback from some racegoers, telling them they will not be coming back. 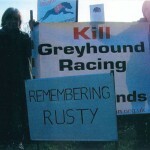 After the group had already spent a long day of awareness with their Remember Rusty Memorial walk in Lewes, they still found time to gather outside their local Brighton & Hove greyhound track, which is owned by Coral bookmakers. The group soon realized the reason why the stadium was more well attended than usual, it was because Groupon were issuing ‘cheap night out’ tickets. But on a more positive note, the group felt their event was a success, as not only did they find that many of the racegoers were ‘first timers’ and some on a work night out, who didn’t really want to be there, also many showed concern when reading the leaflets and banners. Also the stadium shares it’s car park with the supermarket next door, so a good opportunity to distribute leaflets to the shoppers too. CAGE (Coventry Against Greyhound Exploitation) Peaceful awareness protest Brandon greyhound track (Near Coventry) 17.05.2014.
Who would have thought that this long standing greyhound protection group would have to be protesting outside the Coventry track so soon after its recent closure as a licensed track. The group are now planning to hold peaceful awareness protests once again as this track has re-opened as a ‘flapping’ track. 71 cars went in, and only about half a dozen were ordinary ‘punters’- all the rest were ‘flapping men’ with hounds on the back seats of the cars, with no safety harnesses or crates. The track had published an ‘advanced card’with supposedly 11 races to be run. 5 of these races only had 5 runners down, and if the greyhounds we saw going in were only half of the total, that turned up to run, the ‘card’ must have been cut for lack of runners. Will be interesting to see how many races were actually run- (unless, of course, they run some of the dogs twice, in different races) ! All round, it didn’t look like much of a ‘go-er’. More like a ‘private members’night !! Greyhound racing is now banned in yet another state in the USA. This time, Colorado. Please vote on this poll, for which state in the USA you would like greyhound racing to be outlawed in next. Another greyhound dies (by electrocution) at Tuscon greyhound track USA. Rest in Peace dear soul.